Blizzard have released the Cinematic trailer for the World of Warcraft Expansion, Mists of Pandaria. Like all trailers of this kind it tells you nothing about the game. Still, go watch a Panda(ren) beat up a man and a.. bigger, greener man. Sadly DreamWorks Animation have made me unable to watch it without laughing. Board games have had just about every theme you can think of these days, Nintendo, Lord of the Rings, Harry Potter, basically if it has a fan base there is most likely someone trying to cash in on it and what better way to do that than with Monopoly! Well it seems that Blizzard has jumped into the dice filled ocean too. USAopoly has anounced that there will be two new board games revolving around two of Blizzards biggest franchises. The first being Monopoly: World of Warcraft where players will try to be the richest creature in Azeroth. The other game will be Starcraft: Risk which will apparently consist of 290 custom designed pieces and three different game modes. Both games will be appearing this summer for a price tag of 40-50 dollars. This morning, Blizzard announced that they were cancelling this year’s annual festival where they usually hold rock concerts and showcase their latest in game-development. However, there will still be big tournaments for World of Warcraft Arena and Starcraft II later this year in the 2012 Battle.net World Championship Event. It will likely be one of the biggest eSports events of the year with pro-gamers around the world playing for the title. The Championship is said to be taking place in Asia, but dates and times are yet to be confirmed. 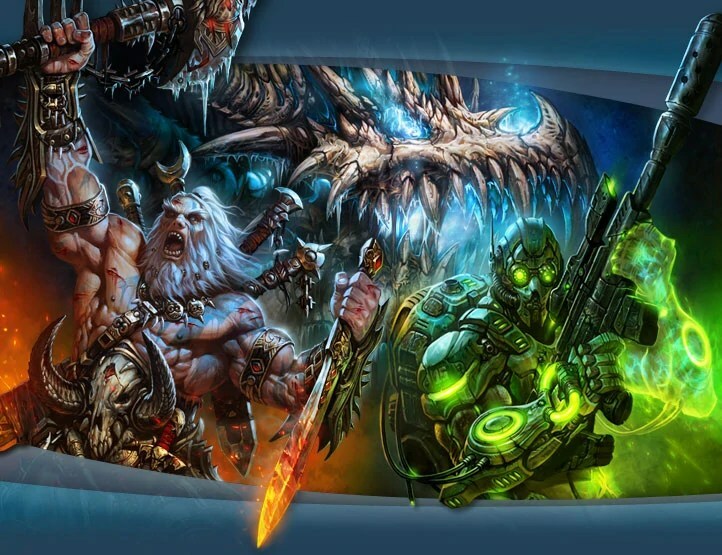 BlizzCon will be returning in 2013 for what will hopefully be the biggest one to date, considering their plans to skip this year, although this is of course good news if it means we get the next set of Blizzard games quicker. Blizzard are known to be working on a mysterious MMO, named ‘Titan’, but the lack of news on that topic continues. But we are still expecting a few games from Blizz this year, including the next World of Warcraft expansion: Mists of Pandaria, the first Starcraft II expansion: Heart of the Swarm, and the third-entry into the Diablo Franchise: Diablo III, which is still in closed beta. Blizzard Entertainment have announced Foo Fighters as the musical guests at BlizzCon 2011. The press release was released yesterday, announcing the headliners for the closing concert of this year’s BlizzCon on the 21-22 Oct.
Foo Fighters frontman Dave Grohl said: “We’re pretty sure that in the future, music historians will look back at BlizzCon 2011 as the unquestionable pinnacle of Foo Fighters’ long and illustrious career,” which you can’t argue with, they had Ozzy himself only two years ago. BlizzCon first started in 2005 with only about 8000 people attending, this year’s Con is looking more like 30,000+ people, and the guests for the closing concert included Level 60 Elite Tauren Chieftain, a comedian, and The Offspring. Since then, it has just got bigger and bigger, with Ozzy Osbourne, and the D (Tenacious D) rocking the halls of Anaheim – just as Foo Fighters will do next month. As of BlizzCon 2009, it was available live via internet stream and covered both days as well as exclusive interviews and discussion, this was available for a much more reasonable price of around £25, and the system is much improved as you now have choice over four halls on what to watch and when, plus it counts as a front row seat to see the closing ceremony. This year, expect to see some Starcraft 2 updates tournaments from literally the best players around, plenty of World of Warcraft coverage, and probably most significant this year, Blizzard’s third franchise which has just gone into closed beta, the much anticipated: Diablo 3. BlizzCon will run over two days on the 21 and 22 of October, and there are still an unallocated number of virtual tickets available from the website, which will give you great views for developer panels, competitions, tournaments, and the closing ceremony, not to mention the World of Warcraft in-game pet, Murkablo! Trion Worlds released their widely popular MMO-RPG earlier this year. On its release many players in the gaming community said that this would be the “WoW-Killer”, and in part, they were correct. While World of Warcraft will always hold Blizzard‘s fanbase close to it, the game itself leaves much to be desired for those who came from other MMO-RPGs such as EverQuest. Where World of Warcraft is lacking in these aspects, however, RIFT takes up the slack. An exciting set of news today focusing mainly on the upcoming FPS Homefront and World of Warcraft gets played by a man waving his arms around using Kinect. Welcome to the first Hot Press of 2011…enjoy!